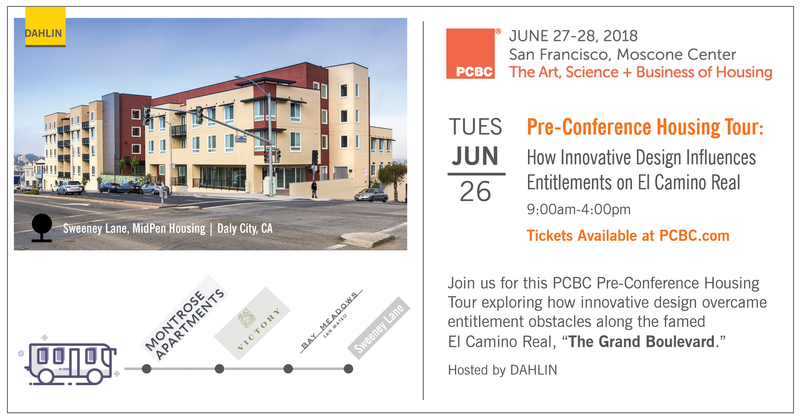 Join us for an El Camino Real Housing Tour on Tuesday, June 26th, part of the Pre-Conference Events at this year's PCBC. Join this housing tour to understand how innovative design overcame entitlement obstacles along the famed El Camino Real, "the Grand Boulevard." Multifamily and mixed-use developments are now replacing outdated auto-centric establishments. As much as Peninsula cities thirst for a pedestrian-friendly, urban lifestyle and support initiatives to maintain creativity and a high-quality of life, entitlement hurdles continue to interrupt the process for developers. Visit a large master-planned community, a major developer’s apartment community and an award-winning affordable development. Tour will include Montrose by Prometheus (Mountain View), Victory at Bay Meadows Shea Homes (San Mateo), Bay Meadows Downtown (San Mateo), and Sweeney Lane Apartments by MidPen Housing (Daly City).